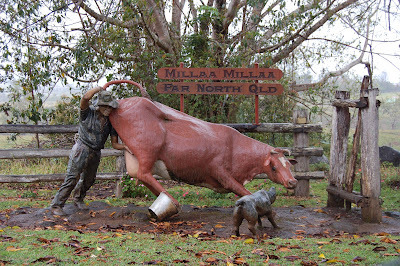 Trawling through some recent photos MB rediscovered her shot of "one of the most photographed statues on the entire Tablelands", according to the http://www.athertontablelands.com.au/pages.asp?code=78 website. Not quite sure what it represents but I guess it gets folks a wondering? Yeah, what's going on? Trying to move your blog image downmarket to attract more hits? Has your grandson turned into bacon?